Who Is the Real President Assad? Once upon a time, Syria erected a formidable barrier of fear that kept its citizens in check for decades. Today, however, authoritarian Baathist rule isn't looking all that insurmountable anymore. If anything, the regime's tactics may now be hemming it in rather than its people. Syrian President Bashar al-Assad may be damned if he meets all of the antigovernment protesters' demands  and perhaps doomed if he doesn't. April 22 was another bloody Friday across the country. Dozens of people were killed on a day dubbed Great Friday (the term Christian Arabs use for Good Friday). Tens of thousands of protesters defied their 45-year-old leader to brave the streets despite a heavy security presence. The chants for reform have increasingly been replaced with the call that has ricocheted across the Middle East from Libya to Yemen and now Syria: Ash-sha'ab yurid isqat an-nizam!  "The people want the fall of the regime." 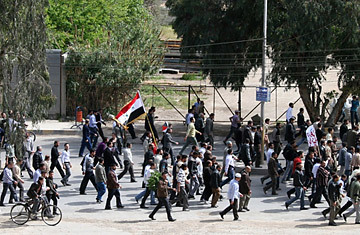 Security forces used live fire and tear gas to disperse protesters in the restive central city of Homs, the country's third-largest city, as well as in several suburbs around the capital, Damascus, including Douma, where eight people were killed, according to witnesses who called in to al-Arabiya and al-Jazeera satellite channels. There were massive protests across the country, from Dara'a in the south, where the uprising first erupted more than a month ago, to the Kurdish regions of Qamishli and Hasake in the northeast. In scenes unimaginable just weeks ago, thousands of people took to the streets. "We are going to heaven, martyrs in our millions!" the crowds chanted in some areas. In the coastal city of Baniyas, people stood sandwiched shoulder to shoulder to listen to protest speeches, footage of which was relayed live by al-Jazeera. "They accuse us of being agents of Qatar, of al-Jazeera," an unnamed speaker said, referring to the tiny Gulf Arab state that is home to and funds the television channel. "Liars!" the crowd chanted in response. "Liars." The speaker continued: "We are not terrorists. We are not Salafists." Assad and his spokespeople have repeatedly blamed the unrest on foreign instigators, satellite media and ultraconservative Sunnis, or Salafists. The latter charge is likely part of the regime's attempt to tie recent events to the 1980s, when a rebellion by the conservative Sunnis of the Muslim Brotherhood was brutally crushed by Bashar's father and predecessor, Hafez al-Assad. At least 10,000 people were believed to have been killed, although the exact figure is not known. The event served as a potent, decades-old deterrent against taking on the Assads. The regime may be reminding its critics of the cost of crossing it. "We are peacefully asking for freedom. We are nationalists," the speaker in Baniyas said. "When it is proved that we are not Salafists, what will they label us then?" The crowd answered with a roar: "The people want the regime to fall!"